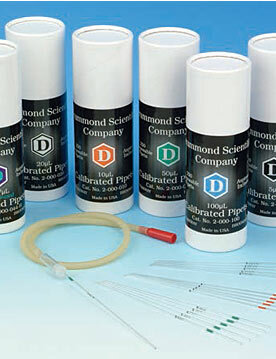 Superior quality, Drummond precision Calibrated Micropipets are available in sizes ranging from 1 to 200 microliters. Ideal for a variety of liquid transfer work, 250 color coded micropipets, plus one 15˝ aspirator tube are supplied in a conveniently designed, easy-to-store cylinder. For blood transfer work, a heparinized 44.7 microliter pipet is also available.